The Newly wed Priyanka Chopra and Nick Jonas gave new dimensions to the bridal fashion world. Every time when the vibrant Indian combination meets western touch, there occurs magical trends in fashion. This time also everyone got stunned by Priyanka’s all new wedding gown. The Quantico star looked gorgeous in a silver-blush beaded lehenga designed by Falguni Shane Peacock. It took a lot of work went into its creation and ensemble. The creative directors for the brand, Falguni and Shane Peacock, revealed the level of work that went into creating the outfit on Instagram. According to the design duo, the lehenga took 80 craftsmen’s 12,000 man-hours of work. The Unique attire is full of featured crystal hand embroidered motifs from the wedding in Jodhpur, including elephants, birds, flowers and butterflies. The celebrity couple tied the knot over the weekend in two ceremonies at the Taj Umaid Bhavan Palace: a Christian service and a traditional Hindu ceremony. In the first function,Chopra pick up Ralph Lauren Gown with a 75-foot veil. Jonas also wore a classic double-breasted tuxedo by the brand that featured a piece of the bride’s dress inside of the lapel having the words “my jaan” which means my life. uncut diamonds, emeralds and Japanese cultured pearls in 22 karat gold, as well as small stars in uncut diamonds. 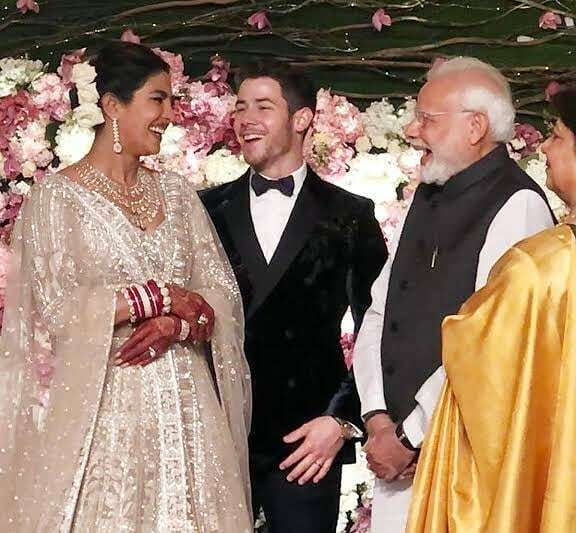 Nick also clothed in a hand-quilted silk sherwani and a hand-embroidered chikan dupatta with a chanderi tissue safa on his head. His looks also got polished with with a rose-cut kalgi and diamond necklace by Sabyasachi, as well as Christian Louboutin gold shoes.